Babies are the greatest joy to all parents. In India, there is a special ceremony held to name the new born babies. Almost all Indian families celebrate this day in great splendor with their near and dear ones. The traditional name of this baby naming ceremony is Naamkaran. Though, long back it was mainly the Hindus that celebrated this function, nowadays, everyone irrespective of their religion, formally choose the newborn's name in a nice party with family and friends. When do you hold Namkaran in India? In accordance to Hindu traditions, the baby naming ceremony is held within a week of the baby’s birth. The most auspicious day would be the eleventh or twelfth day after the birth of the child. Most of the families in India choose the day after taking advice from their religious leaders. 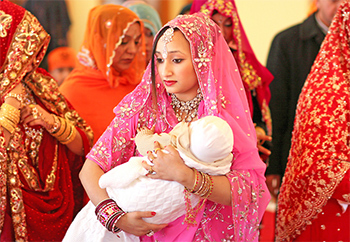 In Hindu baby naming ceremony, many aspects are considered while naming the baby. Where to hold the Naamkaran ceremony? This depends on your family and community. There are some families which hold big parties at home to celebrate the function. Others also choose to hold the party in temples. While some prefer to hold these parties as a private affair, there are several who hold Naamkaran ceremony very lavishly in a party hall with many guests. When you are planning a party, the toughest job is often sending out the invitations. It is very difficult to invite everyone by phone. There is also a chance that you would miss inviting a few important guests in the process. The best option is to use a free online invitation tool like Yoovite.Com to send your invitations for the ceremony. With the tool, you can choose the template you like best, enter the important details like venue, date and time and send them all at the same time. Naamkaran ceremony is mostly held in the presence of a pundit who holds the religious rites for the day and blesses the child. The baby is bathed and dressed in new clothes before the function. After the rites, the parents whisper the name of the baby in his/her ear. Then the name is announced to all the guests in the party and prasaad is distributed to all. It is customary for all the guests to give gifts for new born baby. You can choose the gift according to your budget. Some of the most common choices for baby gift ideas would be gold or silver jewelry, cash, toys, clothes, baby gift hampers, cradles or prams. This way, the baby naming ceremony is carried out in great pomp and splendor to welcome, bless and name the newborn. According to Hindu traditions, completing these rituals is important to make the future life of newborn baby prosperous. Don't forget to hire a photographer for the occasion. You are never going to get the moments back.